The professionals at Custom Climate Concepts understand that the HVAC world is filled with industry terms and acronyms that aren’t readily known. 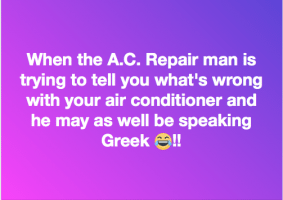 But it wasn’t until we saw this meme in a social media post that we realized a HVAC glossary could be an asset for our customers. That’s why we have compiled some of the basic and important words and phrases, and their meaning, to help you ‘get it’ if your HVAC develops a hiccup. Of course, there is more HVAC language than it is possible to fully cover, so please don’t hesitate to ask us to explain anything we say or describe about your AC system, at any time. You can reach us at 941-955-COOL (2665). Ductwork: A network of metal, fiberboard or flexible material flowing throughout a space which delivers air from an HVAC unit to the respective zones of a home or office. NATE: North American Technician Excellence is the nation’s largest non-profit certification organization for heating, ventilation, air conditioning and refrigeration technicians. NATE is the only technician certification organization governed, owned, operated, developed and supported by the HVACR industry. NATE’s website can be found at www.natex.org. SEER: The efficiency of air conditioners is often rated by the Seasonal Energy Efficiency Ratio, which is defined by the Air Conditioning, Heating, and Refrigeration Institute as the cooling output during a typical cooling-season divided by the total electric energy input during the same period.